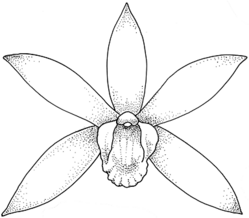 Description: Terrestrial to c. 2 m high; pseudobulbs ovoid, 2–7 cm diam. Leaves 4–8 per shoot, 30–70 cm long, 3–10 cm wide; lamina usually oblanceolate, apex acute. Inflorescences 1 or 2, from the axils of the lower leaves, 70–110 cm long, 5–20-flowered, stiffly erect. Sepals and lateral petals white on the outside, red-brown with yellow veins on the inside. Sepals 3.5–6 cm long, 0.8–1.0 mm wide, oblong-acuminate. Lateral petals 3.3–4.5 cm long, 0.8–1.3 mm wide. Labellum lamina 2.8–5.5 mm long, 1.7–4.5 mm wide, red-brown with a yellow keel inside; spur 5–10 mm long. Most flowers usually setting fruit. Distribution and occurrence: Grows in Melaleuca quinquenervia swamps and in sclerophyll forest, on the coast, at or near sea level; reported north from Lake Cathie, but chiefly north from the Evans Head district.